We all can think of this of this Sunday’s game as Kai’s last high school game. We could, but we shouldn’t. 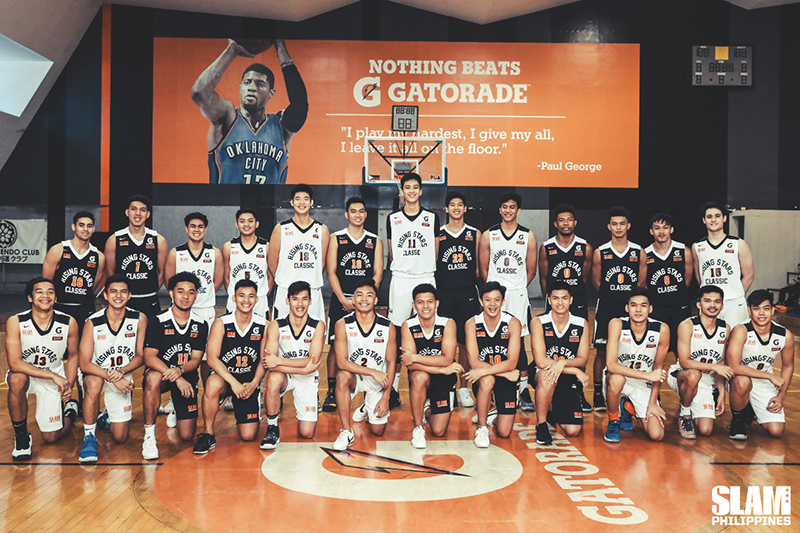 As much as Kai Sotto has dominated the high school circuit, this year’s class is not a one trick pony. The mere fact that Sotto won every conceivable award in his last year in high school and still lose, that says a lot. 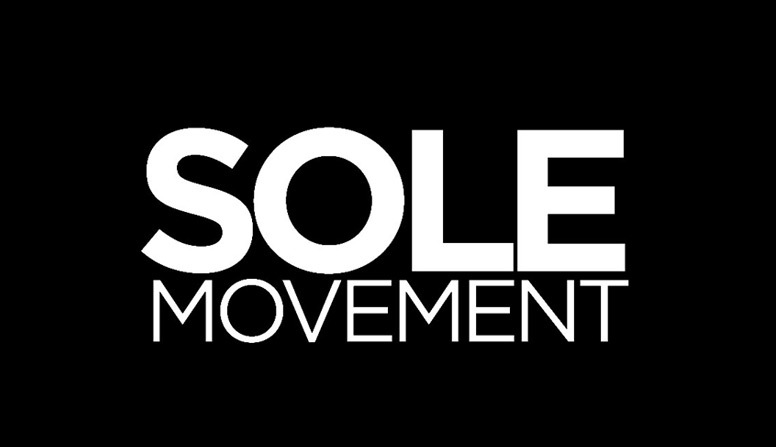 This Sunday, Kai leads an elite collection of the best high school stars in the country. If you thought Kai was tall, wait til you see the rest of Team Hype’s front court. Joining Kai is his Ateneo teammate Geo Chiu. Backing up the big boys of Katipunan will be DLSZ’s Raven Cortez and Mapua’s Jonnel Policarpio. The average height of Team Hype’s front court rotation rounds out to 6’8″. Flanking the Team Hype frontline is a well-balanced group of guards and wings. Forthsky Padrigao joins the other Ateneans in the showcase while Dan Arches, Paolo Hernandez and Clint Escamis complete the representatives of the NCAA Champions, Mapua Red Robins. Joem Sabandal returns for his second run in the Rising Stars game. This time around, he’s joined by his AdU teammate, Adam Doria. Rounding out the Team Hype roster are FEU’s Royce Alforque, JRU’s John Amores and Xavier’s Miguel Tan. If Team Hype was all about the height, Team Punks runs the game with the best scorers in high school. UST’s Mark Nonoy, FEU’s RJ Abarrientos, and LSGH’s Joshua David are going to scorch the nets in this year’s Classic. Mark and RJ are the UAAP’s best gunners with in-the-gym range and confidence while Joshua is a versatile scorer. The Team Punks core consist of the UAAP Champions, NU Bullpups. Gerry Abadiano and Terrence Fortea add to the firepower of back court while Carl Tamayo gives the team some much-needed ceiling. UST’s Bismark Lina, Arellano’s Aaaron Fermin and LSGH’s Inand Fornilos form a hard working front line rotation. 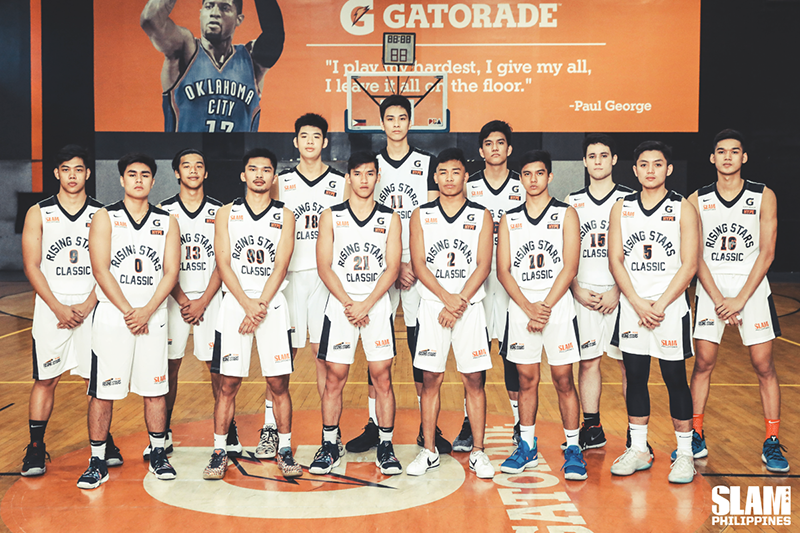 Lyceum’s Mac Guadaña, Hope’s Harvey Pagsanjan and FEU’s Xyrus Torres complete the wing corps while LSGH’s Joel Cagulangan round out the point guards. Team Hype will be led by Coach Yuri Escueta while Team Punks will be helmed by Coach Gian Nazario. A new twist to this year’s matchup is the inclusion of couple of SLAM RSC alums as Associate Head Coaches. Thirdy Ravena who played in the 2014 game will back up Coach Gian while Juan Gomez Del Liano (2017) will join Coach Yuri on the bench. The SLAM Rising Stars marks the last high school game for many of the players in the showcase. For Kai, RJ, Joem, Harvey, Aaron and Mark, it’s their last time to put on a show at the high school level. 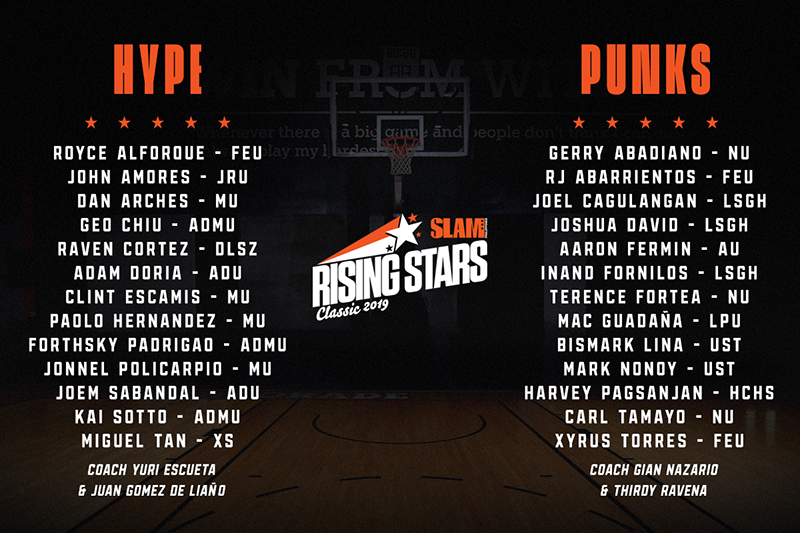 Whether it’s a last run or a final win, the SLAM Rising Stars Classic is a great way for all 26 players to showcase their skills for a national audience, just like Thirdy and Juan did before them. 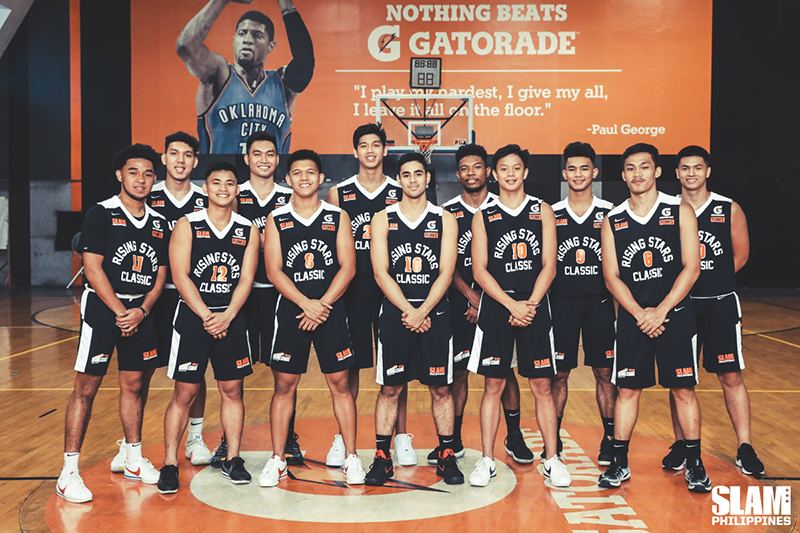 The SLAM Rising Stars Classic will be held on March 31, 7PM to 9PM, at the Gatorade Hoops Center in Mandaluyong. 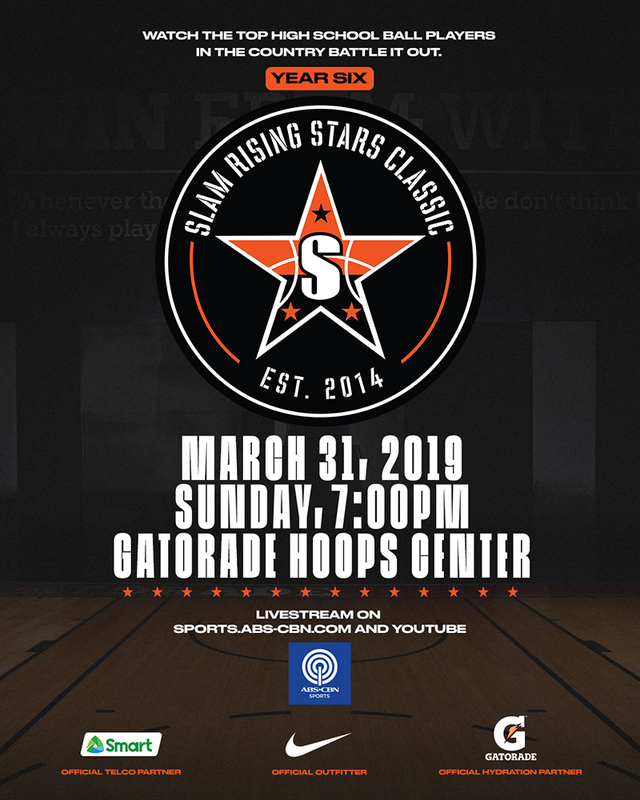 The game will be aired on ABS-CBN Sports via livestream on their YouTube channel.Check out SLAMonline.ph to get to know more about this year’s SLAM Rising Stars.